Lam is best known for making a series of films with “on Fire” in the title, though it seems that is all that connects them to each other. This is the fifth entry into these title-connected action movies, the first of which was made in 1987. 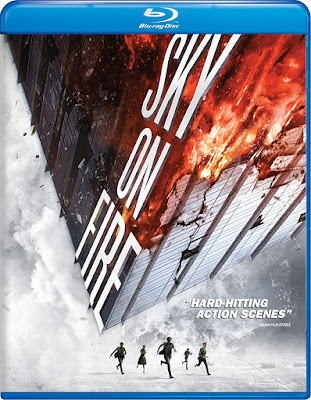 The shifting allegiances and double-crossing of the film’s many characters all center around a building aptly called Sky One, which inevitably ends up ablaze, as the title suggests. Before we get to that climactic action sequence, there are sentimental scenes involving a suffering cancer patient (Amber Kuo), whose brother (Joseph Chang) discovers can be saved by a revolutionary cure created and held in the medical facilities of Sky One. Rather than sharing this cure with the world, the head of the research department (Fan Guangyao) has plans to make the medical discovery as profitable as possible. With the all-too-realistic corrupt choice made by the company to prioritize profit over philanthropy, the heroic head of security in Sky One (Daniel Wu) decides to take matters into his own hands, helping the ailing woman and her brother in a heist to steal the formula. This is only possible because the security guard is conveniently having an affair with the wife of the research head (played by Zhang Jingchu), who helps provide inside information to betray her ruthless husband. If hearing this plot explained sounds complicated, imagine trying to figure it out for yourself. Despite heist sequences, car crashes, a memorable rooftop chase scene, and a moral theme most would support, the film is consistently bogged down by its overcomplicated screenplay. The Blu-ray includes no alternate viewing options or special features. While the high definition adds some to the spectacle provided in the narrative, it does little to improve some of the film’s weaker CGI, including the fire promised by the title.